My first introduction to Grandpa and Grandma Gauger was probably during a visit by them to our farm in Highland in July 2004. Dad, ever the farmer, purchased a small farm in Highland near the mouth of the American Fork Canyon, where he attempted to farm while he worked full time at the Geneva Steel Plant. My sisters, Paulene and Linda, and I were small, three, one and two years old, respectively, at this time. 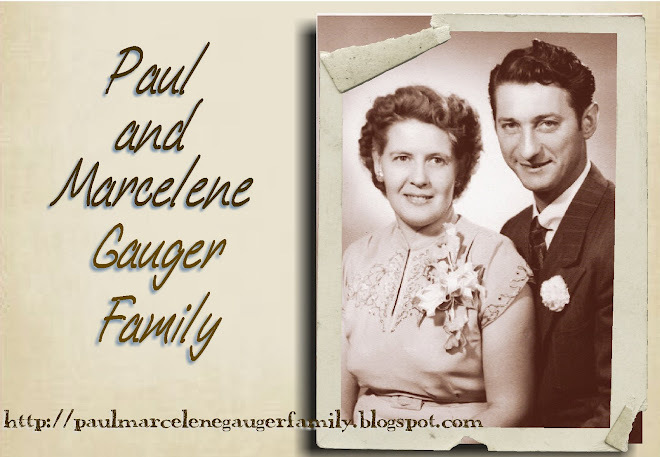 Grandpa and Grandma Gauger were accompanied by Uncle Ralph (Dad’s brother), his wife Rosella, and their two sons, Arvid and Gary. I believe that this was the one-and-only visit to Utah that Grandpa and Grandma Gauger made. Front left to right: Arvid, Paulene, Julie and Gary. Back left to right: Ralph, Grandma, Grandpa, Dennis, Dad, Linda, Rosella. I do have many vivid and happy memories of visiting Grandpa and Grandma Gauger in New Hampton, Iowa every few summers while growing up. These were long, wonderful trips by car where we stayed in motels, ate three meals a day in restaurants (before fast food), and saw some wonderful sights. We generally travelled through Wyoming and Nebraska on the way there, a long, boring route to young children, but the three of us pretty much enjoyed each others’ company in the back seat of the car, and brought or invented games to play. The return trip often was by a northern route, including at times, Minnesota, North and South Dakota, Montana, and Wyoming. Grandpa Gauger died December 13, 1963; therefore only the first trips to Iowa included him in my memories. I do remember Grandpa as a man who was tall, quiet, gentle, and smelled of pipe tobacco. I definitely remember feeling that he loved me. Like my Father, Grandpa Gauger loved to fish and at times took us fishing when we visited. 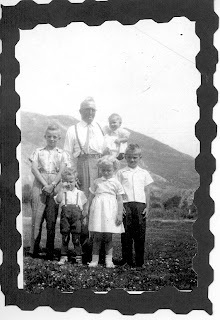 Grandpa Gauger with his grandchildren left to right, Dennis and Paulene in front, Arvid, Linda (held in arms) and Gary. We always stayed at the Gauger home in New Hampton, which was a two-story house located near the base of the town of New Hampton’s water tank. Speaking of water, I do recall how terrible the water tasted in New Hampton compared to our fresh water in Utah. We used to mix Kool-Aid in the water so that we could tolerate it, or drink soft drinks, referred to in Iowa as “pop.” We stayed in a room upstairs where all the bedrooms were and suffered from the humid, hot weather typical of Iowa summers. Our visits also included time spent with Uncle Ralph and Aunt Rosella and their two sons, Arvid and Gary. Earlier in his life before he moved to Utah, Dad adopted a son, Robert. We also enjoyed visiting with Bob and his wife Betty and their small children. Our Iowa cousins and relatives were not members of the LDS Church, but Bob would see that we were driven to church on Sunday in not-too-distant Waterloo to attend the LDS branch meetings. On occasion, we drove out to the Gauger homestead in the farming country just outside New Hampton where Dad was raised. Most of the German immigrants to Iowa were farmers. Dad related stories of how hard and strenuous life on the farm was. He often would be pulled out of school to help on the farm, particularly during the harvest, and was not allowed to participate in sports or other extracurricular activities at school because he had to work. Dad also ran trap lines to earn money that his parents could not afford to pay him. I am not sure how far in school Dad went, but he often joked that he quit after the third grade so that he would not pass up the schooling his father had. Grandma Gauger always seemed to be more animated and “difficult” than Grandpa Gauger. Grandma “Minnie” was often sharp, disciplinary, and hard to be around, but she loved her grandchildren and we could sense this. I believe Grandma had a difficult life, with her first child, our Dad, born out of wedlock and a hard life supporting a family on a farm. She also raised Robert when Dad moved to Utah and left him behind, which I believe gives us a glimpse of the true charity she did possess but not often show outwardly. At times we felt that the New Hampton grandchildren, Arvid and Gary, were favorites, particularly Gary. But thinking back on our visits with Grandma now, this perceived favoritism was probably because those grandchildren were always near her and not just visitors every few years. I have a special memory of Grandma Gauger when I visited her along with Mom and Dad shortly after I returned from my mission in April 1973. Grandma was not well at that time and neither was Dad. We once again drove to Iowa and spend quality time with Grandma, Uncle Ralph and Aunt Rosella. They referred to me as the “Preacher” and repeatedly asked me to pronounce a blessing on the food, even when we ate one night at a local bar and pool hall that was one of Uncle Ralph’s favorite places to eat. We took some special pictures during this trip. Grandma seemed especially loving to me during this visit and it was the last visit Dad had with his mother. Dad preceded his mother in death on December 21, 1978. Grandma Gauger died on September 11, 1979. After I was married, my wife, Katie, wrote Grandma Gauger and sent her pictures of our little children and family. Grandma responded with interest and tenderness, and made a special pink afghan that she mailed for our first child, Molly. The nature of this relationship was somewhat inconsistent with the Grandma Minnie I had known in my early years, but special to me and Katie. I believe this was another glimpse of the tenderness and love for family that really existed in Grandma’s heart. We performed the temple work for Grandma and Grandpa Gauger on June 4, 1981 in the Provo temple. I particularly remember the sweet spirit when Grandpa and Grandma were sealed for time and all eternity. I felt her presence there and commented to my mother and to Katie afterward that I felt impressed that any hard feelings, sharpness, or conflict between Grandma and any member of our family were now non-existent.